We’d love your help. Let us know what’s wrong with this preview of Yum-Yum Bento Box by Crystal Watanabe. Oh, boy—obento! These yummy, healthy lunches are all the rage in Japan, where mothers create them as expressions of love for their children. 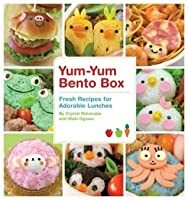 With Yum-Yum Bento Box, Crystal Watanabe and Maki Ogawa devote an entire cookbook to these delicious and adorable meals for all ages! Learn how to craft your favorite foods into a variety of shapes—from caterpillars, cars, and puppy d Oh, boy—obento! These yummy, healthy lunches are all the rage in Japan, where mothers create them as expressions of love for their children. With Yum-Yum Bento Box, Crystal Watanabe and Maki Ogawa devote an entire cookbook to these delicious and adorable meals for all ages! Learn how to craft your favorite foods into a variety of shapes—from caterpillars, cars, and puppy dogs to pretty flowers, princesses, and kitty cats. Yum-Yum Bento Box features chapters on Cuties & Critters, Fairy-Tale Friends, and Special Day Treats, plus a handy shopping guide, easy recipes for mini snacks, general tips and tricks, and so much more. Stop wasting money on pre-packaged lunches—and start making beautiful, healthy bentos! To ask other readers questions about Yum-Yum Bento Box, please sign up. I'm familiar with Bento and expected to see 12 ingredients used in tiny amounts and arranged in an artistic way. Completely expected that. What I was expected was something besides colored rice and pieces of nori. This book was more of a design manual that a recipe idea, which is fine...just not what I expected. I thought this book would include a wider variety of food and give me ideas of healthy lunches to pack for school. Instead, it's little snacks with pink rice, 2 pieces of cheese, a raisi I'm familiar with Bento and expected to see 12 ingredients used in tiny amounts and arranged in an artistic way. Completely expected that. Very cute ideas for children's lunches or for anyone who loves kuwaii bento. This one had a few more recipes for actual, home-cooked food to include but was mostly focused on creating cute foodscapes. Since I'm not very interested in adding food-coloring to my meals or cutting animal ears and noses out of lunchmeat or fish cakes, this was a picture book for me. Part of my new eating healthy kick, some small portions (so variety, yay!) fast to make recipes. pLUS ALL OF THE CUTE THINGS!! I'm less happy about the cute then I am about the easy and the fast, but still yay. Certainly fun to look at, but more difficult than I hoped. Who has quail eggs on hand?! I wasn't a big fan of this book. Maybe the recipes would be good for picky children, but they contain a bit too much processed meat and ketchup for my tastes. Plus if you wanted to recreate the bentos as presented in the book, be prepared to flip around to a lot of pages to get all the recipes. In some cases, the photographs make the food look unappetizing, because fried things appear undercooked. I'm not sure it spent any time on food safety either, such as washing any hole punches or other non I wasn't a big fan of this book. Maybe the recipes would be good for picky children, but they contain a bit too much processed meat and ketchup for my tastes. Plus if you wanted to recreate the bentos as presented in the book, be prepared to flip around to a lot of pages to get all the recipes. In some cases, the photographs make the food look unappetizing, because fried things appear undercooked. I'm not sure it spent any time on food safety either, such as washing any hole punches or other non-food utensils that you might use to cut shapes in food. This really was a visually beautiful little book, full of ideas and creativity. Making these happy little lunches for my daughter sounds like a lot of fun...but also a lot of work. The one thing I really loved was the variety of veggies and fruit, made to look so cute and appetizing. Portion sizes in America are astronomical, so this was an adorable way to get kids to eat. Now just to find the time. This is a cute, simple guide to making bento boxes. Even if you don't want to put this much time and effort into your child (or yours!) lunch, there are some really good, easy recipes in here to take advantage of, and, at the least, some additional lunch ideas. I can't imagine going to so much effort for so little nutritional value. Obviously these bento boxes are for kids, but even in elementary school I wouldn't have had enough to eat with these. Half a slice of cheese; two or three small rice balls with nori faces; three tiny broccoli florets and a cherry tomato. No, don't think so. There are a few recipes that are useful, but I wonder how kids would react to finding fresh sage rolled up in the middle of two whole ounces of breaded chicken breast. I I can't imagine going to so much effort for so little nutritional value. Obviously these bento boxes are for kids, but even in elementary school I wouldn't have had enough to eat with these. Half a slice of cheese; two or three small rice balls with nori faces; three tiny broccoli florets and a cherry tomato. No, don't think so. There are a few recipes that are useful, but I wonder how kids would react to finding fresh sage rolled up in the middle of two whole ounces of breaded chicken breast. I know there are people out there who actually do go to all this trouble to make bento boxes for their kids, but I'd never be one of them; and I certainly wouldn't spend the time or the money on tracing nori patterns or buying in a bunch of craft supplies...for a snack-size meal that will be swallowed in five minutes flat. I wanted this book for so long, but I have to admit I didn't think it was anything I'd be able to pull off. I still haven't tried anything yet, but the difference is now I think I can. They break down lots of recipes to make these cute little bento lunches. They go into the history a bit, and all the tools of the trade. Then they give cost cutting ideas to get the same effect without having to buy a whole new kitchen. Crystal and Maki also encourage creativity and use of leftovers as well as balancing out the meal. I also thought I'd need to get a special bento box, but this is another myth they slash. There are traditional and contemporary boxes, but you can simply buy a small storage container as well. Thanks goodness, I have boxes on hand for that. Well, it is an interesting book. Mainly focused on putting cute things together though, I'm not sure it's entirely practical. I certainly don't have enough time to spend hours arranging rice into specific shapes & coloring it with dyes and so on. Personally I was looking for a more practical book. Presentation is a big thing with bentos & I certainly want mine to look nice (I'm just starting by the way, pretty much a noob) but it still has to fit within a reasonable amount of time. Also I Well, it is an interesting book. Mainly focused on putting cute things together though, I'm not sure it's entirely practical. I certainly don't have enough time to spend hours arranging rice into specific shapes & coloring it with dyes and so on. Also I was hoping for healthy recipes and it seems to me like a large number of the items in here are fried. This book would be better titled _Yum-Yum Bento Box: ALL YOUR FOOD NEEDS FACES_. Special occasion food? Okay! Some of these recipes and... setups? would be great little snacks for a kids' party, but I have a very hard time seeing myself embellishing food this way. I'd rather practice my sushi-rolling skills than coloring rice or artfully slicing bologna into octopuses. I also found the five pages of tools and accessories to be a little overwhelming. I bought this book a while ago. I had never tried bento before but it looked like a cute way to get my picky 4 year old to eat healthier. I will admit most of the things in this book take longer to make than a normal lunch but my daughter loves getting a cute little bento box for lunch. It's more of a special occasion thing but none the less it does do what I had hoped it would do. She eats veggies and likes them! There are so many cute little ideas and awesome tips in this book. My kids have loved the few lunches I have made so far using this as a guide. Cute helpful tips like cook the carrots before you cut them, how to make checkerboard apples and sweetheart sushi Love the penguins. Couldn't do it every day but a nice way to say I love you to kids while they are away at school for lunch. Clever and creative. Super cute but not very practical. They mention nutrition and their food pyramid which sounds reasonable, but then in many of the lunches the only protein is a couple specks of bologna cut out for bunny ears. Also, most of the proteins are bologna or hot dogs. Would love to see a version of this book with ideas that focus more on healthy lunches with much more modest design elements. I loved this book. I don't actually think that I am crafty enough to do this but these ideas are so cute. 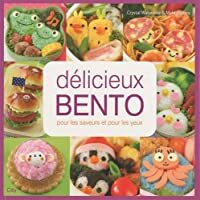 Even if you aren't packing a bento box you could make cute sandwiches and snacks with the ideas in this book. I love making beautiful lunches and this little book had some cute inspirations. I may not necessarily use the same items, but I love looking through here and thinking about how to personalize my own lunch box. Is it art? Is it food? It's both! and Hella better than what's at the school cafeteria--is ketchup still a vegetable? Really nicely illustrated if you think you'd like to try Bento Boxing, this is your guide! Glad it's in my library...sad that I may never love myself enough to put the kind of effort in that is required to make these LOL. Honestly, though, if I ever have to pack lunches for kids, it'd be a cute thing to keep on hand. And I totally get why parents in other countries do this. Cute lunches for the kids! Recipes and inspiration abound. I dont bento much anymore because I'm not motivated to wake up and cook fresh food, but every once in a while it's fun to have a lunch that amuses and tastes really good. Very cute and easy to put together bento lunches. They made the instructions easy to follow and understand! Super Cute food and pretty doable. A freelance indie editor since 2014, I've edited more than 125 short stories and 30 novels. With an interest in science fiction and fantasy, middle-grade fiction, and young adult, I'm proud to assist my authors in fine-tuning their stories and helping them share them with the world.